This is your connection to Blileys of the past and present. What is new? Check the Web site map page. Learn about the Bliley Family of Erie, Pennsylvania from their immigration to America in 1834. For a view into the lives of the Bliley and Wagner families, stop by and browse the wonderful work of Sam and Inez Wagner and the Bliley family members. You will not be disappointed, but be prepared to view nearly 3,000 photos! My grandmother Bliley was very interested in preserving family history. 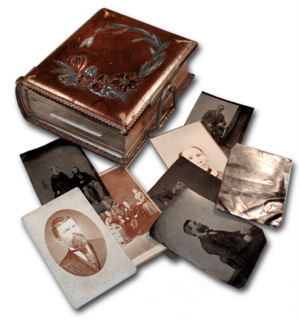 Here is her personal photo album of 75 pictures covering a period between 1860 to 1931. Stories of my early days in ham radio and my mother's interest in the hobby. Resume of my work with online with downloadable samples with descriptions and links to Web professional and personal sites. If you are looking for information on the current products and services offered by the Bliley Electric Company, click on their new logo. This site is not formally affiliated with the Bliley Electric Company (www.Bliley.com) of Erie, Pennsylvania. However, I informally serve as their "company historian" and do appreciate the support they have given me. The views, observations and comments found on this site are those of Charles A. Bliley unless noted, or are of the person credited as the source. If you have recommendations for anything to add to the site, or questions or comments about its content, feel free to send me an e-mail message to K3NAU@AOL.com. This site was initially posted in April, 2000.
by Charles A. Bliley with few exceptions. Please do not use content from this site without permission. For further information, read my Copyright Information page.